This recipe is simple! You'll have everything together in a snap and your guests will love them! 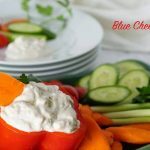 Here's my Blue Cheese Dip and it goes fabulous with Sticky Buffalo Chicken Wings. Slice the green onions thinly, you'll use the green and white parts. Measure out the yogurt and mayonnaise. Add all of the remaining ingredients to a small mixing bowl. Mix together & refrigerate. The yogurt gives it a delicious (lighter) tangy bite! This can be made in advance and will keep in the refrigerator up to three days.